Here’s a tip: be a good customer | Stand Up and Speak Out! 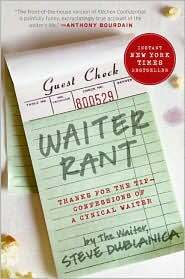 Waiter Rant started as a blog and the writer, waiter Steve Dublanica, then turned it into a book which became a New York Times bestseller. It gives an inside look into the front end of the restaurant business (and a little into the back end, as well). There’s one chapter about bugs and sanitation*, another about Russell Crowe eating at his restaurant and throughout all chapters are stories of customers, some good, but mostly bad. It’s an eye-opening look on human behavior. One story tells of a man who demands to be seated for where he made his reservation, despite the woman having a stroke in that area and it being cleared to give the medics room to work. I work retail so it doesn’t surprise me that people act like this. It just made me hyper-aware of how I act at a restaurant. The are 3 appendixes as well: how to be a good customer, how to tell if you’re working at a bad restaurant, and items a waiter should always carry. Since I’ve never been a waiter, the first appendix was the only one relevant to me (but the other two were still interesting and funny to read). Some of the things he listed were obvious to me, like the Golden Rule and not snapping your fingers to get the waiter’s attention. (Sadly, some people don’t know this.) Other tips were one’s I never knew, especially when it came to wine etiquette. One of his tips on this subject: check to see if the cork matches the label on the wine bottle. All in all, this was a fascinating book to read. Everyone should read it and then take an honest look at themselves to see if they are a bad customer or a good customer. 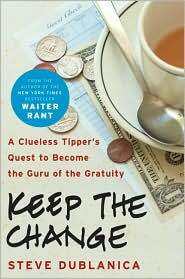 I’m eager to pick up Dublanica’s follow-up book Keep the Change, which is due out in November this year. *I read this part while in bed one night. Dublanica stated, “As you’re reading this, you’re being watched by a dozen pairs of eyes peeking out of the dark corners of your house.” Thankfully, I didn’t have the nightmares I thought I would.